Our single tackle wedges are made from impact resistant high density foam with water resistant Vinyl covers and are available in the below three size options. Senior Single Wedge 32" x 17" x 6"
Junior Single Wedge 24" x 13" x 5"
Mini Single Wedge 20" x 12" x 4"
We can print sponsorship details and logos onto your pads at affordable prices. 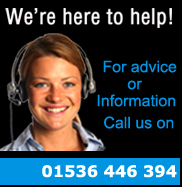 Please call us on 01536 446 394 to discuss your printing requirements.